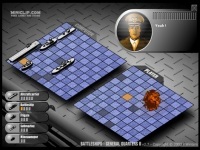 Battleships - General Quarters II is a turn based board-tactical game. You will find the gameplay seems like minesweeper game. The goal is simple, ie. to destroy all enemy's fleet as fast as possible before your fleet gets defeated. Because this is turn based, there will be one winner only. The combat will be going on two boards, one is yours and another is for your opponent. You can not see the position of each ships of opponent as just the oposite, opponent can't see your ships located. So, you will have to guess on which grid on the board the opponent's ships located. And you must destroy all of them before they do that to you. Choose from 10 skill levels versus computer in this portable chess game.